Know the importance of pressure differential in pharmaceutical manufacturing and how it is maintained to prevent cross contamination. The pressure differential is the difference between atmospheric pressure between the production area and its surroundings. 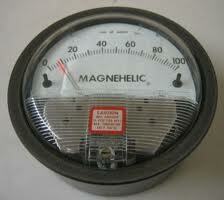 It is measured in Pascal using the magnehelic pressure gauge. According to WHO guidelines on HVAC system, 10-15 pascals of differential pressure is maintained between manufacturing and surrounding areas. The aseptic area should always be highly pressurized than the non-aseptic area and air flow should be always from the aseptic to non-aseptic area. This pressure differential is maintained by HVAC system. In tablet production area, pressure differential helps to prevent the cross-contamination. Dust particles are generated in granulation and compression area; those can contaminate the other products being manufactured in adjacent areas. In sterile manufacturing pressure differential prevents entering the particles and microbes in sterile manufacturing rooms. It is necessary to maintain the positive pressure in the corridor than the tablet manufacturing areas to minimize the cross contamination. But positive airlocks should be there before entering the corridor while maintaining the positive corridor than the manufacturing rooms. These airlocks prevent the direct airflow from uncontrolled area to controlled areas and help to minimize the entrance of contaminated air into the controlled area. In sterile manufacturing area, manufacturing room is maintained under positive pressure than the surrounding corridor because there are more chances of microbial contamination instead of cross contamination. It is important to carry out the pressure differential and recovery tests at the time of HVAC system validation. Pressure gauges should also be calibrated at the time of HVAC validation. It is important to have a good building construction and airtight windows and doors to maintain the required differential pressure. Pressure drop alarms are also used these days to indicate the low pressure in critical areas. The pressure differential may cause difficulties to open the doors, particularly in the facilities having multi-level differential pressure. Some facilities are using sliding doors to prevent this problem but it is difficult to make the sliding doors leak proof.